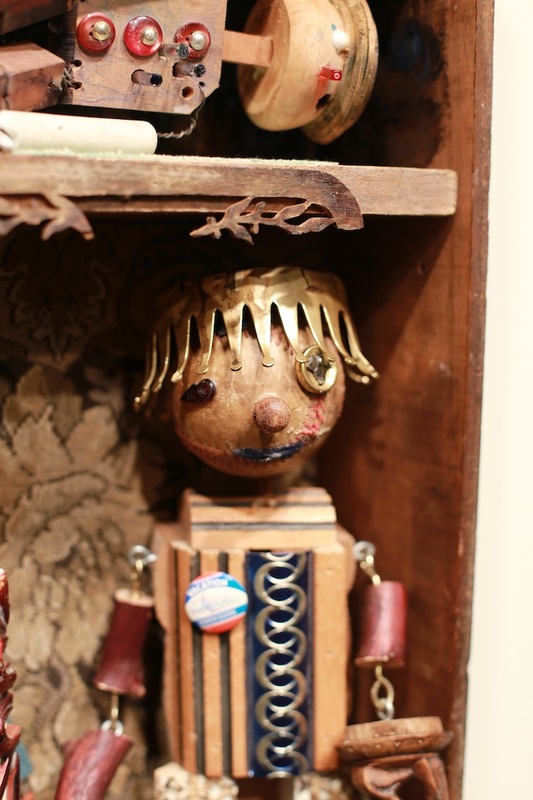 When Catherine Alexander, the director of the Bush Barn Art Center in Salem, asked me to be a part of Curios and Curiosities I felt I was invited to surrender to the process of art making. I am by nature a planner with my work, more often than not doing a variety of sketches before ever beginning something, I know in my head generally what I want a work to look like way before I begin. 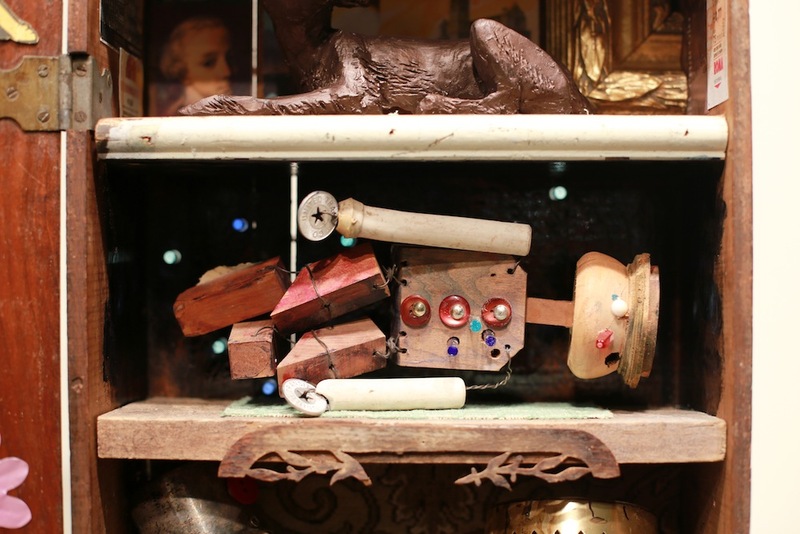 This time I worked differently, I simply looked at the materials I had at hand; the piles of objects, figures, detritus and Tupperware boxes full of assemblage materials, scraps, memorabilia and fabric and I let them talk to me. I looked at what I had at hand and followed where it where it wanted to go. The objects were the words that would create sentences, paragraphs and statements and I found they had much to say once they all got together. Often I create assembled figures and then use them as models for my paintings. These figures more often than not sit on a shelf in the studio or get stuffed in a container to be forgotten or recycled years latter. 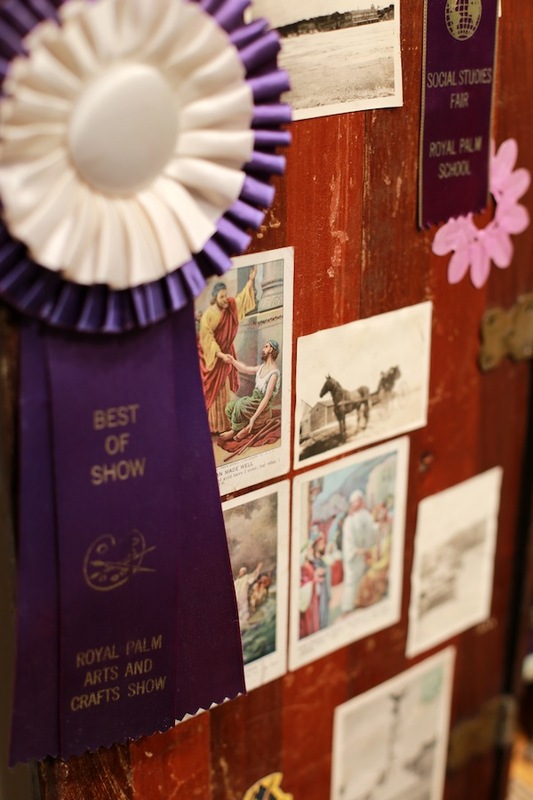 Best of Show began by placing in an old wooden box what was left of three of these figures. At the same time, I found a ceramic rabbit and hound that never really had a home. I had created these three to four years ago doing a demonstration in a sculpture class. Those five characters were the sparks that began the work. They were gussied up, and I began finding a number of other materials that I had for years, including ribbons I won in the 70’s in grade school. These too seemed to desire to join the piece. The pictures and memorabilia I conglomerated together on the walls of the work, reminded me of the studios of many artists I’ve seen like myself who have a spectrum of imagery of influence and interest taped or tacked in their studio. All these things come together in one place to create a curious narrative of their own. This figure has been a model for many works. Here he is shot through with light, as the glass rods that are going through the back of the piece, are also the very thing that attaches him to the box. This character was done for a painting called Brothers that was created over ten years ago. I felt he needed a new hat/hairdoo for the piece. He hadn’t been out in a while. 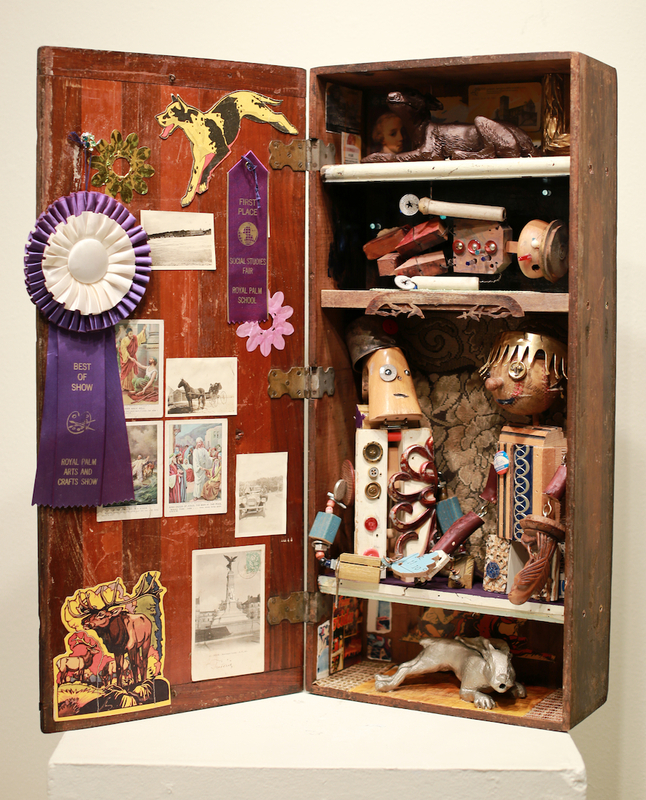 This entry was posted in Art in the Works and tagged allegroical figures, assemblage, curiosity cabinet, folk art, memory box, Wunderkammer art. Bookmark the permalink. What a great art show at the Barn! Once again you’ve created such unique and interesting assemblages! My congratulations to you and your students for a job well done. Thank you, Tim! Brilliant Tim, a thought provoking piece! And Congratulations on the accolades!